After two decades responding to treble nine calls, firefighter Derek Wilson has seen first-hand the devastation a house fire can cause. Now he is working to prevent blazes and protect those most at risk from dying in their own home, especially those over 60. Like his fellow colleagues in the Scottish Fire and Rescue Service, Derek, 43, will never forget being called out to his first ever fire. It happened when he was stationed in Dumfries & Galloway in early 2000. He explained: “I can absolutely remember my very first fire – it was a normal domestic house in a built-up area of Dumfries. When I entered the house, I was overwhelmed by sheer heat and exhaustion – the heat was more incredible than you could ever imagine. “We were faced with thick dense smoke. It’s nothing like house fires you see on TV, the reality is that it is completely black and you can’t see anything. “Nowadays we have thermal imaging cameras to help locate casualties, but we didn’t have them in those days. “But the adrenaline gets you through, and you constantly think ‘if I don’t do something, things will get worse’. “The people in my first house fire were alcohol dependent and managed to escape, but may not have known if anyone else was in the property so we went back into the building, continuing to extinguish and search. You become incredibly focused, and the adrenaline causes your senses to be heightened. You go back to your basic training, automatically recalling everything you have learnt, constantly thinking ‘what are the dangers’, ‘where are the hazards’, ‘where could the casualties be’. During 18 years’ service, stepfather-of-three Derek has worked all over Scotland, including in Dumfries & Galloway, Hamilton and Argyll & Bute, before arriving in Inverness. His reasons for joining the fire service in March 2000 are still valid today. He added: “I joined as I wanted a bit of stability and firefighters were positive role models. There were strong images in the media of what the fire service was doing and this appealed to me. But lives were lost in one of the firefighter’s most memorable call-outs involving a couple in their sixties, something that still sticks with him to this day. He continues: “This house fire happened on Christmas Eve, in a fairly rural area of Dumfries and Galloway, while a couple were out enjoying their Christmas celebrations. They had left an e-cigarette charging which started a fire, and it spread rapidly throughout the house because they’d left all the doors open. “The devastation to the house was incredible – every room was smoke damaged – but what was more tragic was that the couple had a number of dogs and cats, who tried to escape in the blaze, but only their biggest dog survived because it jammed its head in the cat flap. Seeing people lose everything changed him. And it prompted him to specialise in ‘prevention and protection’. Today, the group manager works across the Highlands, Aberdeenshire and Moray in a full-time role that goes hand-in-hand with his regular 24-hour on-call shifts. 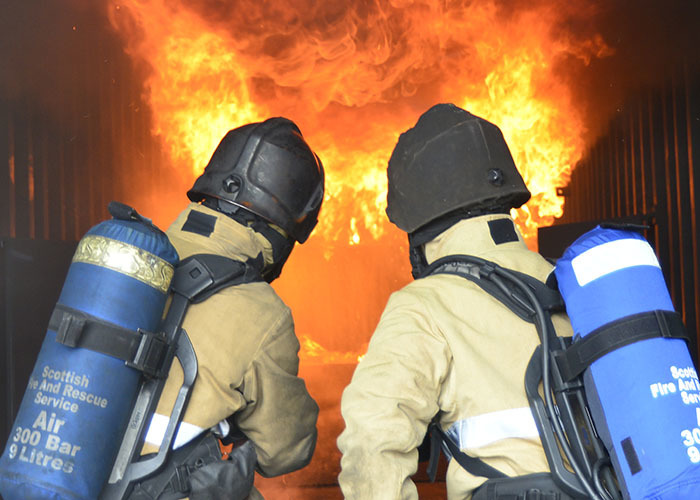 It means he still attends incidents, commanding and controlling the situation, gathering information and making sure people are safe, as well as working out how house fires can be prevented from happening again. And when it comes to elderly people his parents’ age, it is even more important to hammer home the prevention message, that’s because older people are most at risk – 61% of all house fire fatalities since 2013 were aged 60 or over. Plus, more than half of the 31 people who died in accidental house fires in Scotland in 2016-17 were in this age category. The majority of these fires started in the kitchen and many of the lives lost could have been saved by installing smoke and heat alarms. When Derek discovers no smoke alarm has been fitted at a fire-ravaged property, he naturally finds it disheartening. 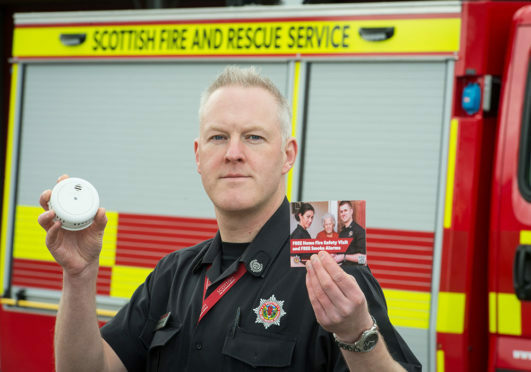 But it’s a trend that he and his fire-fighting colleagues hope to reverse during the 72,000 home fire safety visits they carry out across Scotland each year. During the visits firefighters provide advice on reducing the chances of fire as well as escaping safely. They can even suggest other community organisations who can provide further assistance. The group manager, who has four step-grandchildren, said: “To say it’s disheartening is an understatement. “After some house fires we discover that the smoke alarm battery has been removed, it’s only when people see the damage to their house they realise if they’d replaced the battery, this devastation wouldn’t have happened. Smoke alarms provide early warning when a fire starts giving householders time to get out safely and alert the fire service. The amount of house fires might be falling, but the number of lives lost – especially older people – is still “significant”, says Derek. But why are elderly people are more at risk? He explained: “On a lot of occasions, older people spend more time at home or live alone. They are more likely to be affected by mobility or long-term medical conditions. Limited sight or hearing can mean an individual is less likely to be aware of fire when it breaks out. “When rescuing people from a house fire, the first thing I think is ‘what could we have done to prevent this happening’, that’s why we do home fire safety visits. Many people think ‘it won’t happen to me’, but if it can happen to your neighbour it can happen to you.